While exploring a medieval archaeological site containing the ruins of an ancient English abbey, Annie discovers the long-forgotten tomb of Lady Isabella Devereaux, who had been condemned to death as a heretic in 1349. When Annie curiously examines a mysterious amulet she finds in the tomb, she is suddenly sent hurtling back to the Middle Ages, encountering sorcery, treachery, treason and the ghastly horrors of the Black Death. 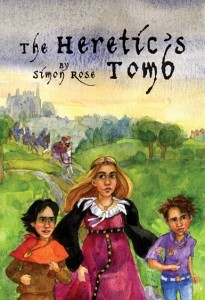 The Heretic’s Tomb received great reviews when it was first published and remains a favourite with young readers today. Read more reviews of The Heretic’s Tomb here on my website.